Over three years of consistent awards for this wine. 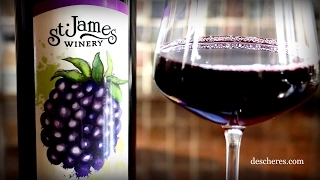 Sweet and tart, St. James' Cherry Wine is better than ripe cherries fresh from the tree! Made from 100% American cherries. Be sure to serve well-chilled. Watch our video for an added bonus tip. Pure, true cherry flavor here, none of that artificial stuff. Surprisingly clean, balanced and not too sweet! Perfect with soft cheeses, over ice cream, alongside grilled pork or for dessert with milk chocolate!